This is the fun stuff. The toys! 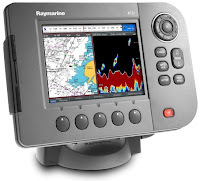 Electronics are the electrical components installed throughout the boat for various purposes. Not to be confused with electrical items, which are the infrastructure of the boats electronics. Batteries and wires are electrical items, but a stereo is considered electronics. The original knot log reads 10 kts standing still, and 10 kts. when I'm at hull speed. Is that ok? I wasn't sure either, so I decided it was time to upgrade to a modern instrument system. I am currently using a hand-held unit for navigation. It works just fine, but it slides off the seats and requires frequent battery changes. It also is a very poor interface for plotting courses and reviewing or managing waypoints. 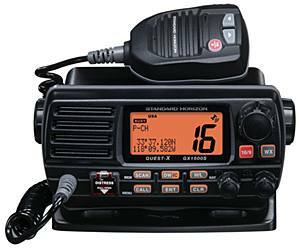 While not as critical as a VHF radio, I view this as being a pretty important piece of equipment, especially considering that it feeds the ability of a VHF radio to transmit current position to those who would come to aid. Purchasing the Bebi Owl was a no-brainer, but mounting it took a little more thought. In this project I mounted the Owl anchor light inside an Aqua Signal Series 40 housing. A small plastic (OK, fiberglass) box to mount my chart plotter and auto pilot head will run me about $400. Seriously? I think I can afford to botch this project up about 20times and still come out ahead. It's not that hard, but it is time consuming. This worked out well to fill time gaps while waiting for other orders to come in. The old unit only picks up weather. No transmit, no receive, no good. I promised my wife that I was going to responsible when it comes to safety, and with very nice units costing less than $200, there's just no excuse. In my dream I'm enjoying a little Jimmy Buffet while I gently rock on my anchor rode sipping a glass of wine watching the sunset. I don't need to shake the keel, but a boat has to have tunes, and mine currently does not. The mast on Ravat was fit with a combination deck light / steaming light. Unfortunately, neither of those lights worked. I also really wanted an anchor light hard wired into the boat, and I wanted it atop the mast. Ravat had a strange mix of Aqua Signal and Perko lights, neither of which pleased me. The housings were worn out and the fixture assemblies were corroded. Time for something new. This project installs Aqua Signal Series 25 lights on the CS27.